It was the lead story of the "CBS Evening News." ... On "NBC Nightly News," it was: 'DOUBLE STANDARD?" ... ABC's "World News Tonight" called it 'SELECTIVE OUTRAGE?" 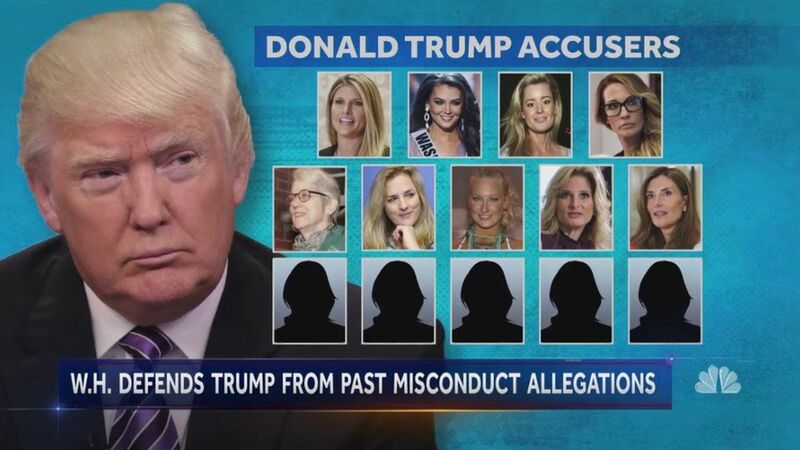 "[A]fter a wave of harassment claims against powerful men in entertainment, politics, the arts and the news media, the discussion has come full circle with President Trump criticizing the latest politician exposed for sexual misconduct even as he continues to deny any of the accusations against him." President Trump's taunting of Senator Franken ("Al Frankenstein") for an accusation of sexual harassment, while maintaining a restrained response to the Roy Moore alleged revelations, is re-raising past questions about the president's own treatment of women." "The charges leveled against him emerged in the supercharged thick of the 2016 campaign, when there was so much noise and chaos that they were just another episode for gobsmacked voters to try to absorb." "[T]he president who rarely sits out a feeding frenzy is selectively aiming his Twitter guns at those under scrutiny. ... Trump has been largely mum as Washington Republicans try to figure out what to do about Moore." The response ... At yesterday's White House briefing, Sarah Sanders said: "The American people, I think, spoke very loud and clear when they elected this President." "I think in one case, specifically, Senator Franken has admitted wrongdoing, and the President hasn't. I think that's a very clear distinction."